This gives us the opportunity to meet and walk through your garden together to discuss initial ideas. 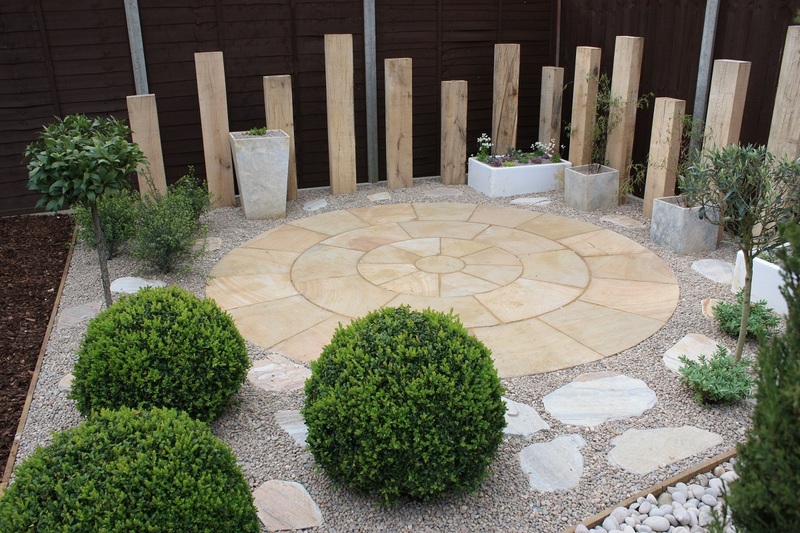 My aim is to combine the practical use of your garden with engaging and beautiful design elements using both hard landscaping materials, structures and planting. During a garden survey I take photographs and note the garden aspects with measurements of the plot, including any level changes (topography). 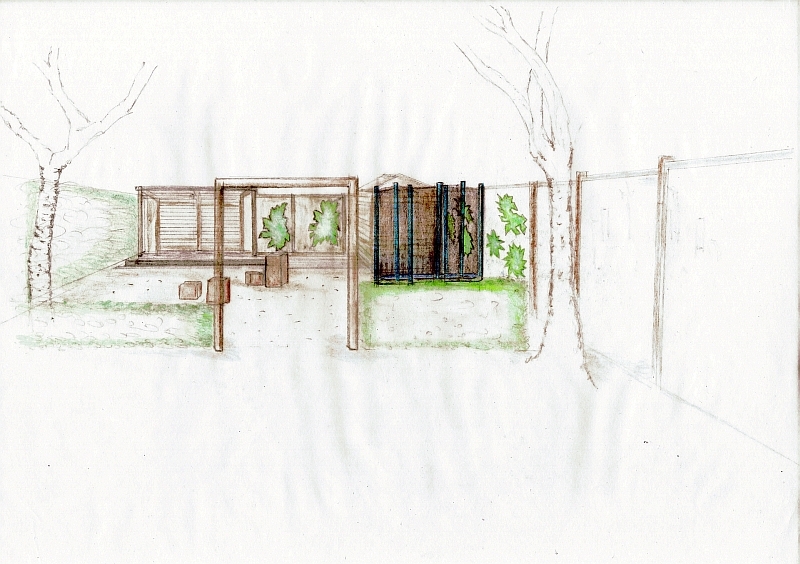 I include any existing features, such as out buildings, house and garden boundaries, trees and any planting to remain. A soil sample will also be tested for soil quality and pH. For more complex sites, a RICS land surveyor may be required. 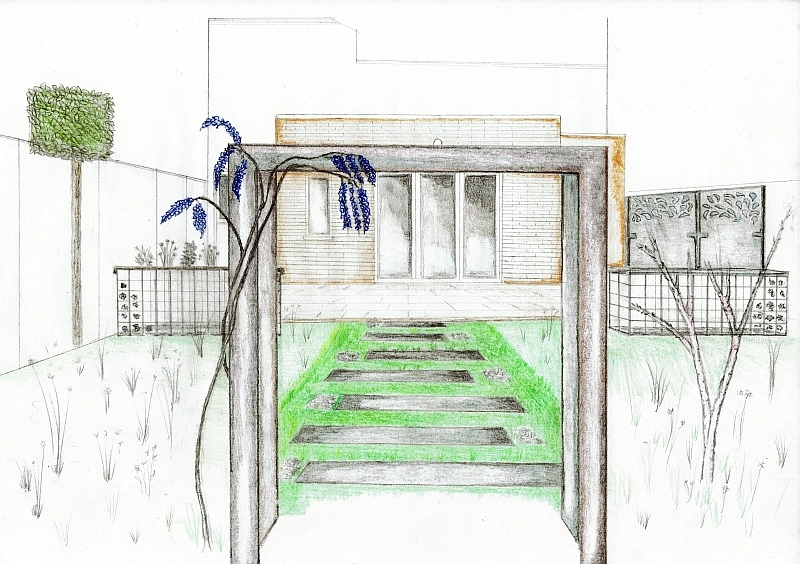 Perspective sketches help clients to visualise a new design. I also set up a private Pinterest board to use throughout the project, adding ideas for the key elements in the design; such as landscaping materials, garden structures, lighting, garden furniture and design ideas suitable for your garden. 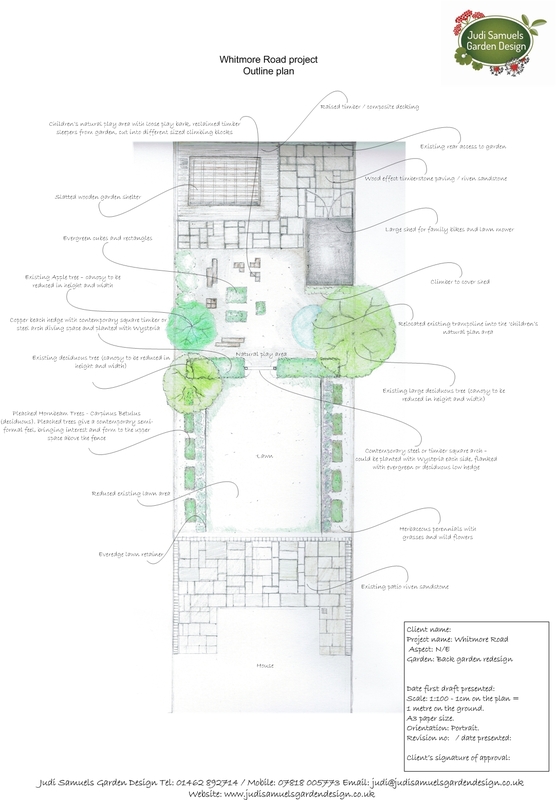 An outline plan is created from the garden survey and gives a clear overview of the new design and position of the key design elements, including the initial planting ideas in each area, identifying any existing garden features to remain, such as, out buildings, plants and trees. Following your approval of the new design, a detailed setting out plan will be produced for your landscaper or builder to work from. 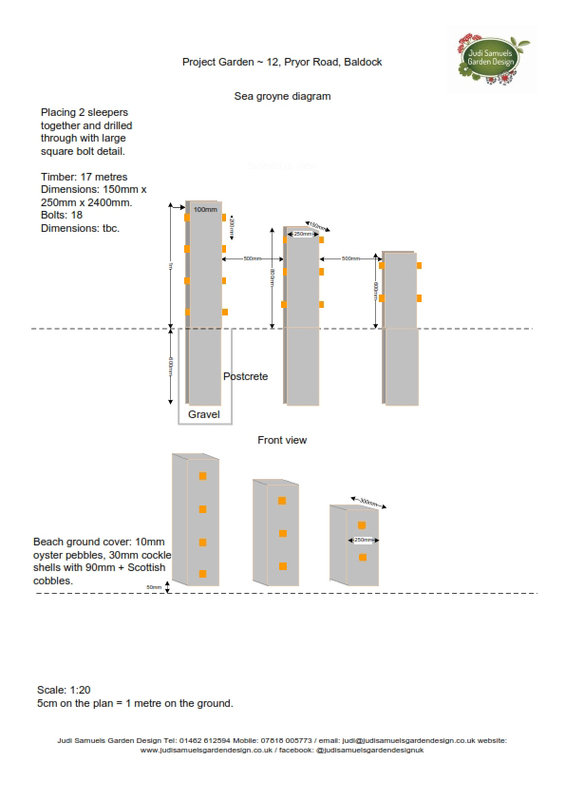 All materials will be specified on this plan and additional construction diagrams may also be supplied for the constructed elements within the design, such as; garden steps, decking, retaining walls, garden arches etc. 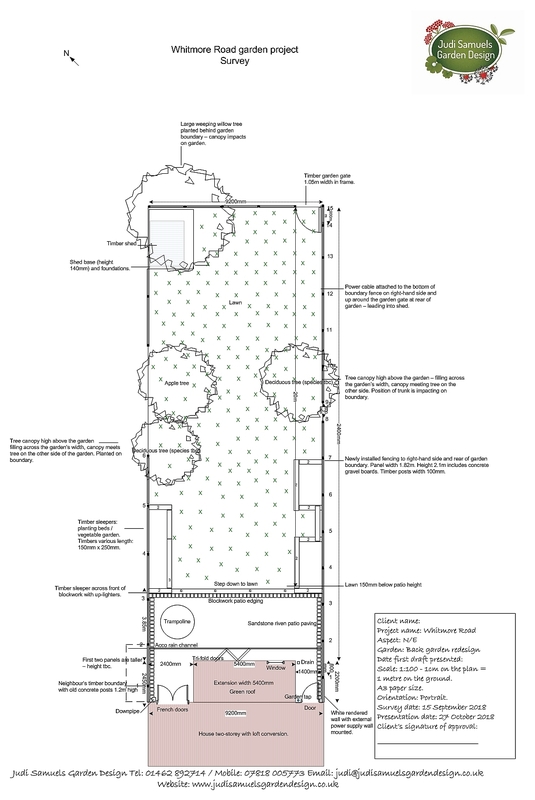 Construction diagrams are drawn for all constructed elements within the design and a detailed specification list of all materials going into the garden will be supplied. It is advisable that a planning meeting take place between myself and your landscaper / builder to discuss the design installation on the ground. Amendments may be made after this meeting and once signed off, it is then laminated onto A3 and worked from. Planting plans can be created for individual borders and whole gardens and are prepared during the early design stages. Where there is more than one planting opportunity for planting design, a planting plan is prepared for each location. Planting plans include plants lists with details of each plant’s dimensions at maturity and growing conditions required to ensure healthy, long living plants. Planting design gives you the opportunity to express your personality in your outdoor space, colour palettes can reflect your style inside your home or by playing with new colour, form and texture. Planting design really is limitless! Of course, the only practical limitations may be space, soil type and aspects within the garden, however, I will always advise on the best plants to grow in your garden’s available conditions. A care calendar is a very useful tool to clients who may wish for a bit more information and guidance on looking after the plants in the garden. The care calendar is delivered monthly straight into your email with instruction, advice and care tips for every plant in your garden. A login will be provided. Once the design plan has been signed-off and the landscaping contractor has agreed a project start date, you may wish for me to attend at agreed intervals to ensure the design is being interpreted correctly on the ground. Also to be at hand to answer any questions that will inevitably arise during an installation. This service may be particularly useful to clients who are working and not able to be home during the project installation. I work with a project assistant and on occasion with clients who want to experience ‘hands-on’ the planting-up. This is a great way to get to know the plants going into your garden and creates a relationship right from the beginning. Other services include sourcing and purchasing the plants stock and ensuring plants are of the highest quality before placing into position for planting. 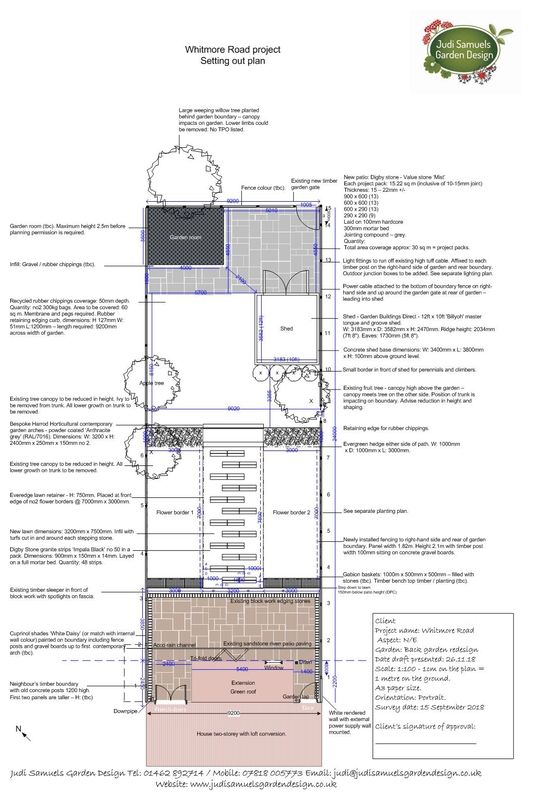 The planting plans are created to an A3 size and laminated to be water and soil resistant. They also make a nice ‘keep-sake’ once the garden is finished and as the garden grows and develops it’s a record of how it all began.. Please visit my fees, terms and conditions page for further information about potential costs.